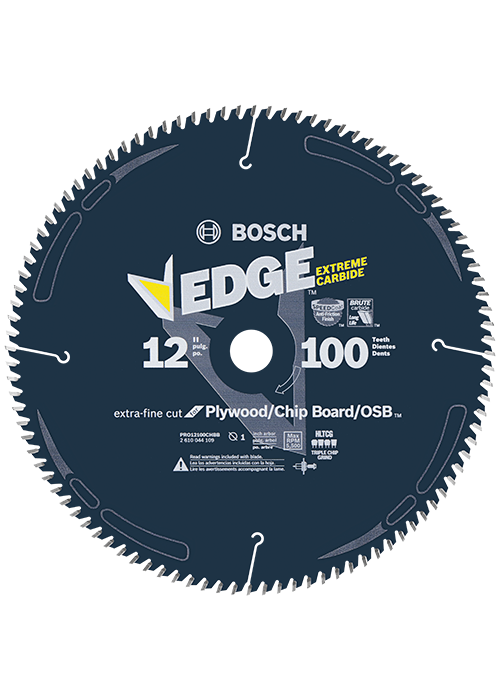 Bosch Edge Circular Saw Blades start sharp, stay sharp and resist impact damage for long life. They are designed for tough construction jobs, because they are engineered with Brute Carbide, an upgraded C3/C4 micrograin carbide formulation that increases impact resistance. They have triple chip grind tooth geometry and high tooth counts designed for fast cutting in OSB and plywood, and they cut plastics and PVC. They also feature ultra-sharp post-paint grinds to stay sharper longer and to resist impact damage. To avoid warping, these blades have been built with expansion slots. These blades also feature control cut shoulders to reduce kickback, and they have body slots for excessive heat.